How to Fill Your Closet with New Stuff – While Making Money! Even if you have a fantastic job that pays you well, being a young adult often means you’re strapped for cash. Due to student loans, going out with friends, buying gifts for a whole slew of occasions, and keeping up with bills, it might seem like you’re always struggling to make ends meet. Unfortunately, that means not buying as many fun and frivolous items as you used to. That’s where the Stella & Dot Independent Stylist program comes in. This side hustle is the perfect opportunity to treat yourself to a bunch of new, stylish accessories without draining your bank account. This job has TONS of flexibility. It’s up to you how much you work and, in turn, how much money you can make as a Stella & Dot Independent Stylist. Keep reading to learn all about this program and how it can earn you some extra cash fast! In case you haven’t heard of them, Stella & Dot is a super fun company that sells jewelry, accessories and even clothing. Their designs are always on-trend without looking like something you’ll want to toss next season. No matter what your style, this brand has something you won’t be able to live without. From statement earrings to delicate chains, bags with fun patterns to chic sunglasses, you’ll be yelling “Take my money!” at your phone. But in fact, if you sign up to become a Stella & Dot Independent Stylist, they’ll be paying you! What Does Stella & Dot Sell? The short answer is pretty much anything you can wear or carry! Stella & Dot offers a stylish inventory of clothes, bags, jewelry, and accessories that match the season. Spring brings light, billowy blouses and ruffled tees in sunny colors. In the bag category, you can grab a cute weekender bag for a short trip, the perfect new beach tote, or a pretty pouch for date night. Head to the accessories section for a new pair of sunnies and a sarong for your beach vacay or a funky patterned scarf. And don’t forget what they are known for: gorgeous jewelry! Stella & Dot carries pieces that match every style aesthetic. Whether you need a minimalist necklace for every day, statement earrings for a special event, or some boho bracelets for festival season, they have it all! Want more examples? See what’s new in the Stella & Dot Spring 2018 Collection in the video below. What Does Being A Stella & Dot Independent Stylist Entail? Unlike typical jobs, being a Stella & Dot Independent Stylist means your career is in your hands. There is no 9-5 grind in an office, no boring meetings to sit through, and no stressful commute each day. It’s up to you how many hours you work each week and how you go about earning your money (more on that later). You can work when, where, and however often is best for you! There are no sales minimums, shipments to deal with, or quotas to meet. Some similar side hustles are super stressful because they require employees to sell a certain amount of product or sort through and store inventory in their own homes. That’s not the case with Stella & Dot! Instead of getting products sent to you and having to frantically get rid of it, your customers order straight from a website. The only stuff you’ll have to lug around is your own awesome collection to show off what the company has to offer! And if you have an off month for sales or don’t have as much time to work as a Stylist as you normally do, that’s ok too. Trunk Shows are your best bet for making the most money in the least amount of time. First, ask everyone you know (friends, family, neighbors, coworkers, you know the drill) if they’d like to host a Trunk Show for you. Once you have a Hostess, she provides the space. In turn, she gets awesome new accessories for FREE or 50 percent off. That’s when the fun begins! Order a sample set from Stella & Dot to show all the amazing products you have to offer. Be sure to bring a lot of your own items from the brand, too! You get to make money in a comfortable setting but don’t have to deal with the cleanup hosting a party requires. Guests of the Trunk Show can browse through Stella & Dot lookbooks and through your inventory to find their favorite new pieces. As a Stella & Dot Independent Stylist, you can also give them style advice. This works best when you know the guests and their personal styles, but anyone with an eye for fashion will do great at this part! Once they have found their perfect pieces, the other ladies put in their orders with you. It’s that simple! Unlike those stuffy Tupperware parties of the 50s, Stella & Dot Trunk Shows are all about having fun and sharing fashion advice with your favorite gals. Don’t forget to bring wine! Also known as an eBoutique, this is where your fellow fashionistas come to check out Stella & Dot’s totally trendy pieces. Because it is open 24/7, this platform allows customers to shop from you anytime, even after the trunk shows are long over. Your website is a great supplement your Trunk Show earnings and helps market you as a Stella & Dot Independent Stylist. Your eBoutique is perfect for selling to customers who can’t physically be at one of your Trunk Shows. Maybe your BFF is studying abroad or your grandma lives in another state. They surely would want to support your growing business but getting there is just not happening. Drop far-away loved ones your URL and you’re sure to get a spike in sales! An important aspect of being a Stella & Dot Independent Stylist is sharing your style on social media. With influencers raking in tons of cash online these days, everyone is looking to social media for their style inspiration. While you won’t directly make any money by doing this, it will drive traffic to your eBoutique and boost interest in Trunk Shows. Think of how you spend the hours when you first wake up, before bed, or on your daily commute and lunch break. You’re probably scrolling through social media anyway, right? Why not turn that into easy cash? Simply snap a pic of you in your fave Stella & Dot look for Instagram or start a Facebook group asking your gal pals to be Trunk Show hostesses. Have a friend who loves accessories (and making extra dough) as much as you do? Recruit her to become a Stella & Dot Independent Stylist, too! You’ll make more money the larger your sales team grows and she will reap both the fashionable and financial rewards. Did you know that having common interests is key to a lasting friendship? According to The Telegraph, we form our tightest friendships based on the hobbies and side hustles we share. That means you and your BFF can grow even closer or you can meet a group of new besties through this job. Yet another awesome perk! Mentoring new stylists is a fun way to make new friends or bond with old ones. What’s better than hanging out and chatting about fashion with your fellow girl bosses? Plus being a Sponsor to a new Stylist not only helps her get the hang of things but might teach you a new way of looking at your business. What Are The Perks Of Being An Independent Stylist? Being a Stella & Dot Stylist comes with tons of fun perks that will make both your heart and your wallet happy. Stella & Dot Stylists earn between 25 and 35 percent commission on all of their sales. So the more you sell, the more you earn! You’ll also get to shop all of their fabulous bags, jewelry, clothing, and more at a discount of up to 50 percent off! Did we mention free stuff?! When you purchase your Stella & Dot Independent Stylist starter kit, you’ll get credit for Stella & Dot jewelry and accessories between $350 and $1,500. It all depends on which starter package you purchase. Even if you get the smallest kit, you still earn enough credit for a whole new accessory wardrobe. Now you’re probably wondering “How much do Stella & Dot Stylists make?” The company estimates that casual Stylists working 5 hours or fewer a week can earn up to $400 per month. 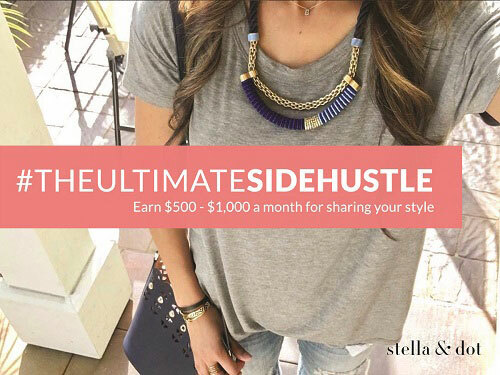 Stylists who treat Stella & Dot as a part-time gig, putting in around 12 hours a week, can make up to $2,800 each month. For those who want to make being an Independent Stylist their full-time career, Stella & Dot suggests working at least 15-25 hours each week to earn between $4,500 and $90,000 per year! That’s only about 3 hours per day. Easy, right? This is all on top of incredible travel and networking opportunities, cash bonuses, and other perks you can earn. What If I Don’t Have Sales Experience? Don’t worry if you have absolutely zero sales experience. Stella & Dot provides tons of support and training to help you get in the groove. They actually have multiple platforms to help you get your business up and running. Each Stella & Dot Independent Stylish is matched up with a Sponsor. This is another girl boss in your area who will show you the ropes through one-on-one training. She’s always there to chat with you both with business questions and emotional support if you’re ever feeling overwhelmed. You can also get social and swap tips with your fellow Independent Stylists at local meet-up events. So fun! For even more help, Stella & Dot offers 24/7 online help for when a question or situation is keeping you up at night. Not to mention weekly calls with Home Office, an annual conference, and regional training events! You’ll feel confident in your sales skills and part of an awesome sisterhood of Stella & Dot Independent Stylists in no time at all. Does It Cost A Lot To Start Up? Nope! All you need is a $199 investment and a few spare hours each week to start making your dreams come true. If $200 sounds like a lot of money to you, think about it this way. That price gets you the Essentials kit, which includes $350 worth of free stuff, training materials, your own personal shopping site for clients, marketing materials to get your name out there, and 50% off your purchases for your first 30 days as a stylist. That’s a lot! If you have a little more to invest, try the More to Love kit or the Ultimate Kit. Though they cost more outright, you’ll have lots more (free!) inventory to show off, which will definitely entice potential customers. The company’s goal is to help you gain the most amount of profit in the fastest time possible. You’ll find it’s easy and fun and will actually help you earn money, not drain your bank account. All you have to do is put down a little bit of money up front, and your business is up and running! Soon your wardrobe will be full of stylish pieces that you will be eager to show off. If you have literally one free hour per day, you can do it. Being a Stella & Dot independent stylist allows you to pursue your passion for fashion and help others discover their signature style, all while making a paycheck. While some side hustles can be boring and tedious, this one lets you hang with your girls and get paid for it. Win! Sign up here to start making money as a Stella and Dot Independent Stylist. What’s your favorite piece from Stella & Dot? If you’re part of this program, do you have any suggestions for Independent Stylists just starting out? Let us know in the comments below!